People are living longer today than ever before, but the share of the working population is shrinking. At the same time, more of the financial responsibility is shifting from public to private balance sheets. This could have significant financial consequences for individuals, insurers, employer pension funds and society in general. Public-private partnerships are needed to overcome this challenge. Life and health reinsurance is part of our core business, and we are the world’s largest reinsurer of mortality risk. Consequently, we are a natural home for the longevity and health risks associated with ageing societies, and have the financial strength to take on risks across a person’s whole lifespan. Swiss Re has a broad base of expertise to help insurers understand the medical and social factors that affect longevity, mortality and morbidity, and we can bring new insights from our experience in markets around the world. We want to help clients create solutions that better support people across the different phases of ageing and retirement. 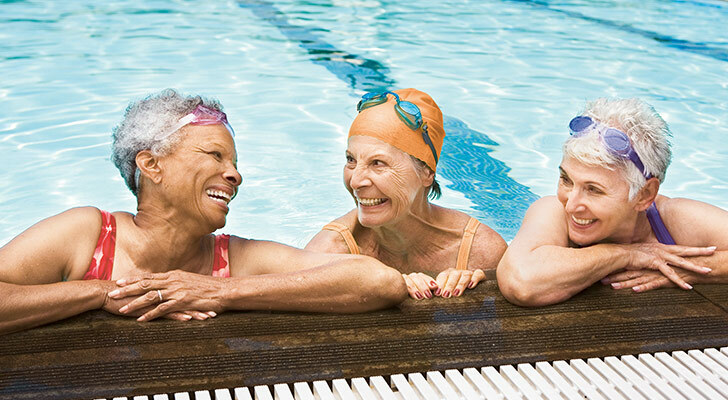 Staying fit and enjoying it … By devoting one of our Top Topics to “Funding longer lives”, we want to help ensure that people can continue to reap the benefits of living longer. The 2016 Entrepreneurs for Resilience Award of the Swiss Re Foundation focused on innovative solutions that enable the elderly to live independently at home. The four entrepreneurs in the final selection share CHF 800 000 in prize money, which will allow them to further their inventions ranging from robotic helpers and video therapy to online care coaches and health monitoring. We hired a dedicated Head of Ageing to prioritise Swiss Re’s efforts in this area and lead a global team of experts from various functions. Our immediate priority is to better understand the needs of elderly consumers across different markets and share lessons learned in an increasingly complex social, economic and regulatory environment.